I am a Californian… we don’t do real winters (unless we venture to Tahoe to hit the slopes). But all this winter wishing has me wanting a white out, like snow day status (that’s a real thing right? not just in the movies?). White is a color that generally scares me since I can’t seem to keep it clean but oh how it calls out to me. My monochromatic blood is saying yes to these delicious white pieces. 1. Zara Perforated Booties – First seen on Style Wax Poetic. I love how she styled these and since Zara is having a huge sale they are a no brainer addition to any wardrobe. 2. Margiela Small Bucket Bag – Everything about this bag says buttaaaaa to me. The leather just looks so supple. I also adore that the white is very soft here without looking cream. 3. Maiyet Machu Picchu Stud Bracelet – Wow. A truly stunning piece of workmanship and design with a price to match. So stunning. 4. Everlane The Ryan Pocket Tee – I am cheating a little bit here because I own this shirt in the 4 other colors offered on the Everlane website. They are so soft and lovely. 5. Narciso Rodriguez Claire Zip Tote – I am a little fuzzy on this one but the description does note it as being “Ice” sooooooo. 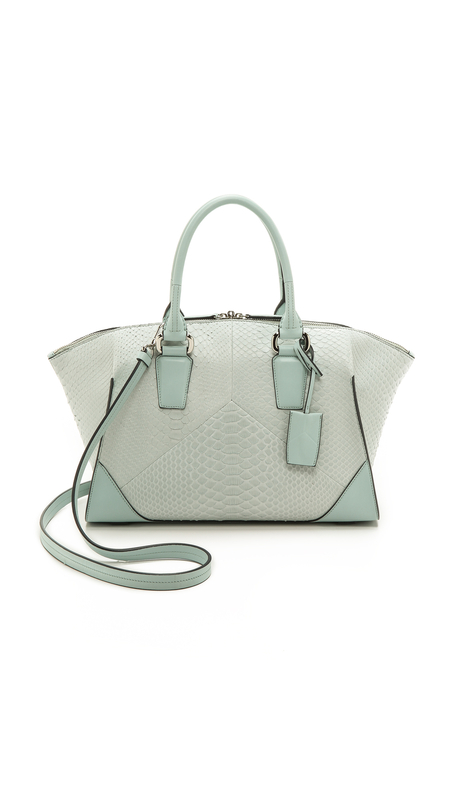 How amazing is the white with the mint, but how more amazing is it that this is made of python. 6. Toga Pulla Suede Loafers – This is the perfect bit of funk for this list. Enjoy the funkiness. 8. Rosetta Getty Twill Coat – First look at the styling on this, just look. Second the coat, the coat. That’s all.